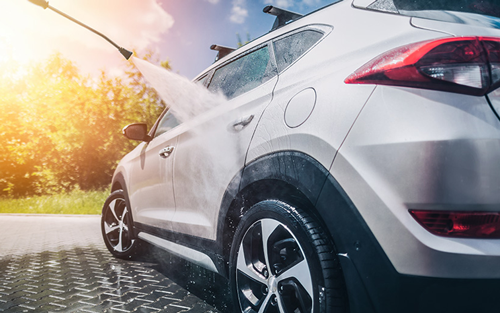 Pressure washers have been in use for cleaning purposes for quite a long time and they are considered a superb invention that makes the task easy and quick. However if you want perfect results, you need to choose perfect machine. In this post, we will discuss the features that are important to consider while planning to buy a pressure and also some of its benefits. Pressure washers are available in both gas and electric versions and either of them are effective in use. Electric pressure washers are usually preferred because they are quieter and require less maintenance. They are perfect for use in food productions, car dealers and the places which are not too big. On the other hand if you are looking for a more flexible option or need it for large area, you can consider gas pressure washers. PSI and GPM are equally important to consider when choosing a pressure washer. Only pressure with low volume has no coverage or capable of moving anything. Volume actually moves the dirt and gives speed and is actually a key for cleaning larger surfaces in less time. Our cleaning tasks usually remain delayed because of shortage of time and pressure washer is the machine that is invented to resolve this problem. It becomes a matter of minutes to clean the outside of your house, your driveway and your car. Not only this, they are equally beneficial for commercial use. Cleaning tough filth is a hard and time consuming task without using a pressure washer. Pressure washers can do it in few minutes quite easily. Be it grit, oil stains or anything, a good pressure washer can clean it all. A pressure washer does bigger tasks but is very convenient in its usage as well as the storage because it is small and light in weight. You can easily move it from one place to other. There are many more advantages of using Pressure Washers for cleaning purpose but choosing one carefully and wisely is a must. Here is one of our most commonly selling Cold Water High Pressure Washer – G-165 by our Italian based principal IPC Portotecnica. IPC Portotecnica Model: G 165-C I 1610AM is a trolley mounted pressure washer for ease of movement and maneuvering. Ergonomic and robust handle, large wheels and wide wheelbase provide easy and comfortable transportation. The machine allows delivering and adjusting the quantity of two different detergents. The starting handgrip, the detergent tap and the inlet water connection are placed on the front side of machine. Here are some of the features of the machine. The machine goes off automatically when the trigger gun is released. Increases the life of the pump. Axial pump with head in brass. Pistons with excellent mechanical characteristics. Electric induction motor, two pole. Maintenance free. The motor is protected from excessively high temperatures by a thermal cutout. Professional gauge to constantly check the working pressure. To know about complete range of pressure washers available with us, click here.